Unwind in a spacious well-appointed 500+ sq. ft. studio in a country setting surrounded by beautiful serene gardens. Your private room is nestled in a neighborhood of up-scale country estates. Enjoy your morning coffee on the private deck overlooking the flower gardens. Comfortable queen bed with additional double futon available. Complementary WiFi, 46' HD flat screen TV with DVD player. Microwave oven, compact refrigerator & coffee maker. Comfortable & clean, peaceful space to unwind or enjoy the many activities Portland has to offer. Central air/heating. Athletic and fun loving couple. Enjoy gardening, tennis, golf, and cruising in the Northwest waterways. We enjoy people of all ages and look forward to hosting you in our home as you pass through Portland or pause and stay awhile. Handicapped accessible space & shower. Unwind in a spacious well-appointed 500+ sq. ft. studio in a country setting surrounded by beautiful serene gardens. Your private room is nestled in a neighborhood of up-scale country estates. Music CD's can be played on the DVD player. Small assortment of books to read during your stay. Small assortment of DVD movies to watch. Country setting surrounded by beautiful serene gardens & lawn area. 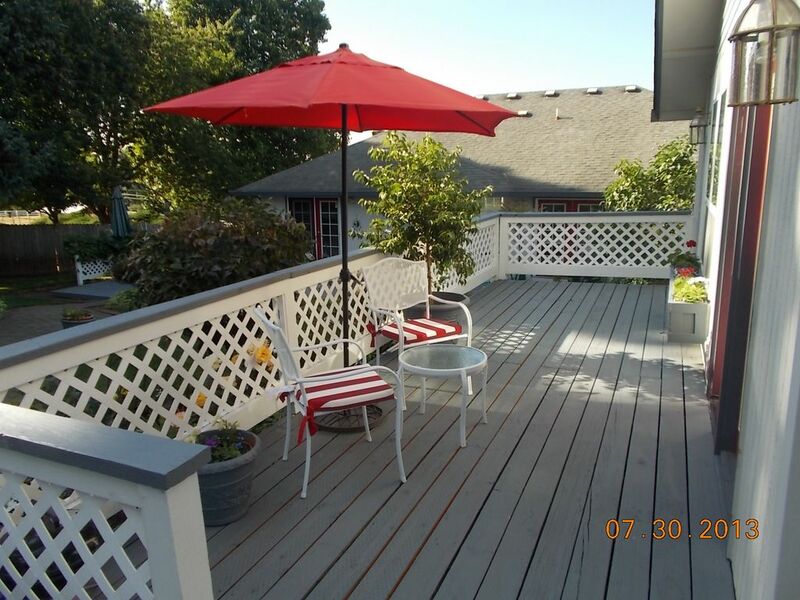 Enjoy your morning coffee on the private deck overlooking the flower gardens. Handicapped accessible space & shower, including wider than normal doors. Wish my stay was longer! Great amenities and great location. Well equipped and perfect location! Our daughter lives in Wilsonville so this location was perfect for us. Very comfortable and clean. Beautiful area for morning walk too. Thank you for a wonderful lodging option...so nice not to be in a hotel. Perfect location, easy access to area. Hosts are great! We have stayed here numerous times over the years and always enjoyed our stays. We loved everything about it. Clean, comfortable, and cozy. Jim and Betsie were wonderful hosts. We would definitely return and we would recommend to friends and family. Close proximity to the areas top wineries, as well as numerous running, walking, tennis, golf & pool areas nearby. Approx 15 min. to Downtown Portland. Close to Starbucks coffee, grocery stores, restaurants, shopping & happy hours.